The AR revolution has reached a high point with enterprise adoption outpacing the consumer world. As the ways in which we interact with technology evolve, the AR technology has reached a tipping point, with enterprise-wide adoption outpacing the consumer world. 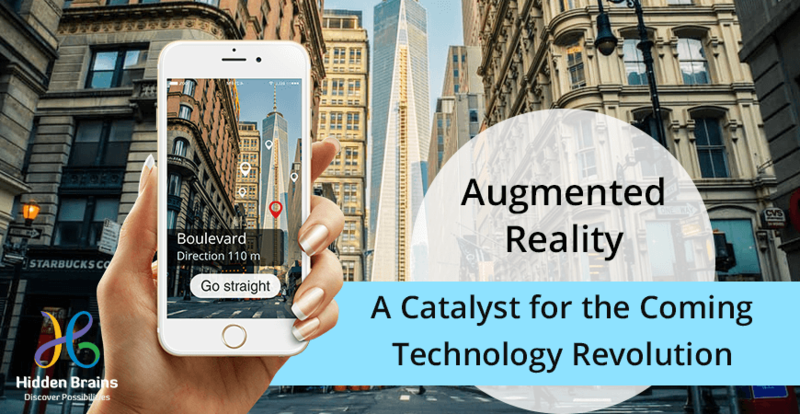 Augmented reality app development is gaining prominence across numerous industries such as healthcare, public safety, gas and oil, tourism, and marketing. Everyone from tourists, medical practitioner to retailer is able to benefit from this ability to place computer-generated graphics in ones field of vision. New AR technologies are set to change industries and transform the way we interact with the digital world in everyday life. Several technology giants note that Facebook and Google have invested heavily in virtual reality and augmented reality. Over the next decade, advances in digital reality—an amalgamation of augmented reality (AR), virtual reality (VR), mixed reality, 360° and immersive technologies—will lead to more natural and intuitive ways for technology to better our lives. Augmented Reality (AR): Augmented Reality is an interactive and immersive experience that uses existing real-world environment whereby the objects are “augmented” by computer-generated perceptual information. Virtual Reality (VR): Virtual reality (VR) is a computer-generated interactive experience taking place within a simulated environment involving auditory and visual, as well as different types of sensory feedback like haptic. Features body- and motion-tracking capabilities. Mixed Reality (MR): Mixed reality (MR) is also referred to as hybrid reality, quintessentially the merging of real and virtual worlds to produce new environments and visualizations where physical and digital objects co-exist and interact in real time. Read More: How Can Businesses Benefit from Augmented Reality (AR) Apps? Augmented reality comes in as blessing for industries such as Telecommunication, manufacturing, as well as energy where workforce is spread across different geographies. In such industries, AR can be used for communication and training. In fact, the healthcare industry is also using AR in diagnosis, treatment and care processes. As teams are scattered across the globe, getting everyone involved in a timely fashion to review a design, gather all information essential for the review and strategize further action turns out to be a daunting task. AR allows seamless interaction with a 3D model of the product and viewing different stages of the model with all stakeholders, teammates, as well as third-parties. At the moment, users connect with AR through smartphones, headsets and smart glasses. However, the future will transcend to other senses as well that’s currently underutilized. For instance, it will not just be about viewing through headsets, rather using hands to interact and feel which will be considered transformative. Cameras and visual sensors are now deployed within different facilities—from government offices to stadiums, city streets to manufacturing sites. AR bridges the divide between the physical and digital worlds by widening the horizons and leveraging voluminous information and insights produced by millions and billions of smart and connected products worldwide. Companies from diverse industry verticals are making use of IoT-enhanced AR/VR for their specific purposes. With IoT-enhanced AR equipment, workers can conduct maintenance training minimizing the risks of working from hazardous conditions, as well as repair or replace equipment at client locations or in the field, being walked through the proper steps. IoT-enhanced AR provides real-time access to new information or techniques, avoiding extensive retraining. The increasing adoption of IoT-enhanced AR and associated training will fasten the speed of services and capabilities delivered to employees and customers. To build IoT-enhanced AR app, request for a free quote now!